The beautiful deep red wine color of garnet will appeal to those who love the stone in this art deco crimson authentic garnet ring in 14K yellow gold ring from Apples of Gold Jewelry. 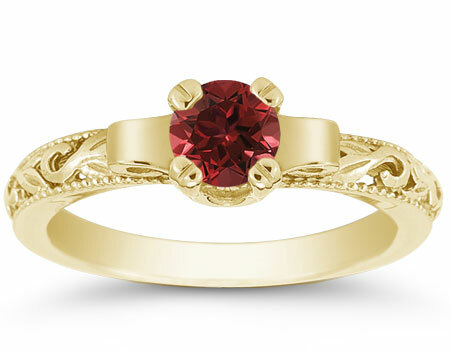 An intricately designed 14K yellow gold ring is home to a stunning, crimson red garnet gemstone, which is round cut and AA rated. The stone is a perfect way to celebrate love and is sure to be a heart warming gift for any recipient! We guarantee our Art Deco Crimson Garnet Ring, 14K Yellow Gold to be high quality, authentic jewelry, as described above.